What happened on the other missions to the Moon after Apollo 11? Six more missions to the Moon occurred after the historic flight of Apollo 11. One of them almost ended in tragedy: Apollo 13 was more than halfway to the Moon when an explosion ruptured the oxygen tanks and destroyed most of the ship’s systems. Through courage, luck, and incredible hard work on Earth and in space, the spacecraft managed to loop around the Moon, using the flyby as a gravitational slingshot to fling the ship and its crew back to Earth—shaken, but alive. The other five missions went off without a hitch. 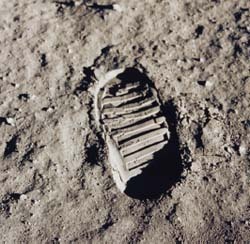 Fifteen more astronauts went to the Moon in those missions, and ten of them set foot on the surface. They explored, conducted geological and astronomical experiments, collected lunar rocks and soil, rode in a “Moon buggy,” and more.